Let Metallic Products’ fixed louvers bring the benefit of fresh air to your metal buildings. Designed specifically for your pre-engineered metal building wall panels, they allow fresh air to flow indoors, while keeping out the moisture, snow, ice and insects. A weather-resistant build allows your fixed louver to stand up against the elements, while its 45-degree, roll-formed blades, 4” depth and riveted frame encourage security. Metallic Products fixed louvers feature 55% free area. Louvers are self-mulling, self-flashing and self-framing. No other trim required. Louvers are chemically treated before painting. Louvers can be painted to match pre-selected colors by manufacturer. Standard paint is an electrostatically-applied powder paint, 3 mm thick with an oven-baked finish. Standard operator is by a reinforced cast aluminum hand crank. Optional: Chain operator of #35 sash chain, with plastic-coated chain pull handle. NOTE: Please specify panel type when ordering. Frame has a recessed head to accept the wall panel and side flanges fit specified panel profile on 1’ modules. Sill is tapered to provide drainage and exclude moisture. 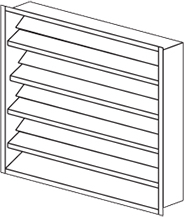 Flat flange louvers are also available for installation into framed openings. Additional materials available include stainless steel, aluminum and Galvalume. All louvers are shipped with an 18 x 16 aluminum insect screen mounted in a removable, rewireable frame. Hardware cloth is also available. Louvers are shipped individually in heavy-duty cardboard cartons.